Is it ever too soon to begin outlining the history of our current world? What if we could pinpoint individuals responsible for the real-time horrors humanity is experiencing both domestically and globally. In order to push forward with solutions for humanity, we must do everything we can to fight back in this war of information against the globalists, with truth, healing, positive energy and sharp and effective education. One of the strategies I believe we should implement, is to point out individuals working behind the scenes in the globalist new world order, instead of only exposing companies and corporate labels. For example, instead of saying, did you see how CNN slandered 9/11 truth seekers? It would be more effective to say: did you see how Jake Tapper of CNN slandered the 9/11 truth movement? Focusing on the individual, forcing accountability on the individual and challenging the 'individual' on social media, blogs, and other platforms, could become a powerful weapon for truth. It could make future CNN, NBC or FOX reporters and writers think twice before volunteering for the next anti-truth story. Perhaps it may put pressure on reporters to take sides in this battle for truth, maybe rethink who they want to work for, or perhaps rethink how they would want to be remembered long after they have passed away. Keeping this concept in mind, I want to bring your attention to Erick Stakelbeck. Who is Erick Stakelbeck you ask? He is one of the most important individuals responsible for the creation of the domestic war on terror. Sounds ridiculous? You say how can one man be responsible for the creation of the war on terror? Here's how it works. Meet Erick Stakelbeck, the well respected "sought after authority on Middle East and national security-related issues with extensive experience in television, radio, print and digital media." according the Christian Broadcasting Network website (cbn.com) where he has his own show "The Watchman". Where else can Stakelbeck be found? According to his CBN bio he is a "regular contributor to Glenn Beck’s The Blaze TV", and "has made hundreds of appearances as a commentator on leading national television and radio programs and is a regular guest on Fox News". Stakelbeck is promoted as a trusting voice at one of the larger Christian media platforms in the country, add to that, affiliates who share the programs, then add to that, all his TV appearances where he regularly poses as an "expert" on terrorism with Glenn Beck, Fox News and others. Can you imagine how many people Eric Stakelbeck is reaching with his "expert" message? You might argue, but what if he is wrong? Can you appreciate the magnitude of the damage he would be single-handedly creating? When I first came across Stakelbeck's name, I was thinking, it can't be that bad, so I researched to find out what his credentials are. I wanted to know, what makes Stakelbeck such a definitive "expert" on issues of the Middle East and "security related issues"? He himself is not Muslim or from the Middle East but he's an "expert". Isn't that like bypassing an interview with a medical doctor to instead interview a lay person who is a self proclaimed "expert" in Medicine? The lay person may very well be an expert, but in most if not all circumstances one would still opt to publicly interview the medical doctor on issues of medicine, if for no other reason than to appear legitimate. This "expert" label seems to be the first level of the deceptive control system. Is Stakelbeck the prime example of a globalist pre-selected, artificially engineered "expert" with almost no real background, a highly elusive biography, and an entirely unverifiable list of credentials. A glance at his CBN bio exposes that Stakelbeck worked with Steven Emerson who is one of the core originators of the phony war on terror with his documentaries, "research", and "investigative reports" throughout the early and mid 1990's. That was well before the 9/11/01 false flag. Like an effective construction worker, Emerson was contributing to the work needed by the globalists, creating the war on terror, behind the scenes. Emerson produced a propaganda documentary "Terrorists Among Us, Jihad in America", which sounds mighty similar to Stakelbeck's book: 'The Terrorist Next Door: How the Government is Deceiving You About the Islamist Threat'. You think Stakelbeck learned a thing or two from his mentor Emerson? Ironically, in perfect propaganda timing, Stakelbeck released his book on May 2, 2011. That was the very next day after the establishment announced the Bin Laden death hoax. Within the next couple of weeks Stakelbeck goes on various networks including Pat Robertson's CBN using the Bin Laden death hoax to announce his new book. The Bin Laden death hoax of May 1, 2011 I've argued repeatedly, marked (in my humble opinion) the official launching of the so called 'domestic war on terror'. Stakelbeck starts popping up in all the conservative platforms warning America as an "expert" voice that now that Bin Laden is dead, soon the terrorists will be here in America. He interviews with partner Middle East "expert" Walid Phares who tells millions of Christians, conservatives, and right wing viewers that soon the average American "lone wolf" will be the most dangerous terrorists, according to Phares, especially those who are "not" with Al Qaeda. Within a couple of weeks of the May 1, 2011 Bin Laden death hoax, the domestic war on terror had been officially born. "Stakelbeck has delivered addresses at several public forums, including events for Christians United for Israel (CUFI), ACT for America, the U.S. Department of Homeland Security, the American-Israel Public Affairs Committee (AIPAC), the International Israel Allies Caucus Foundation (IIACF), the Jewish Institute for National Security Affairs (JINSA), the Values Voter Summit and the Faith and Freedom Coalition, among others, on terrorism and Middle East-related issues." I was determined to find out what are Stakelbeck's actual educational credentials and what makes him an expert. My search however, only brought me to other people's work. Apparently I wasn't the only one who had tried to verify Stakelbeck's credentials. Someone had tried doing just this several years ago and failed as well. Step A- Organization XYZ will have Erick Stakelbeck speak. Step B- Because organization XYZ has allowed Stakelbeck to speak, Stakelbeck is now an expert. Step C- Because Stakelbeck is now an "expert" we can now say that ... Stakelbeck is an "expert". And with that, the circular logic is looped to itself, and the birth of an expert is created out of thin air. Stakelbeck is an expert because he has written articles claiming to be an expert on many different news papers. He doesn't seem to have any verifiable degree and his claims are inconsistent with the known history of synthetic terrorism admitted by the globalists. Also no one seems to know concretely what constitutes being an "expert" on Middle East terrorism. Is this an admission that he has worked behind the scenes in creating terror groups and is thus an expert? Actually, that brings me to another observation. Writing a book on a topic apparently instantly makes you an expert as well. I was actually told this by someone years ago. They said that writing a book about something instantly gives the person perceived credibility. In practically every introduction Stakelbeck is introduced as an author and thus instantly credible. No mention of exactly what he has done to be considered a true "expert" in terrorism and Middle East affairs. It seems that the mark of expertise can be paid for, is apparently pre-ordained, and some individuals are pre-selected to become "experts". These "experts" then make public appearances, statements, speeches, lectures, and seminars speaking to the very same organizations that ordained them as experts to begin with. The circular aspect of all of this is what struck me as the most fascinating. Say hello to the underside of the control system and how they have maintained their stranglehold on America with tactics just like this. Individuals like Stakelbeck are textbook operatives. An individual who has worked with previous prime operatives for the fabrication of the original war on terror. Stakelbeck had seen the magic of the creation of the war on terror throughout the 1990's. He watched them do Oklahoma City, NYC on 9/11 and years later there he was in perfect timing, releasing his domestic war on terror book on the day after the Bin Laden death hoax. With that one move I'll say that Stakelbeck made himself the founding father of this particular now endless 'domestic war on terror' war that is now the greatest threat to America. Everyone knows that the 'war on terror' has no end date and neither does the 'domestic' war on terror. If we are all taken away, if many or most of us die, if America is no more, let someone remember the name Eric Stakelbeck. For it was he (and a few others) who said yes, to the globalist plans to enslave the world. It was he who put his lies in the minds of millions upon millions of Americans, to convince them that Al Qaeda who had been proven to be a CIA asset all along, was now in the U.S. It was Stakelbeck who spearheaded the fraudulent domestic war on terror against average Americans everywhere in this propaganda operation which now has no end. Only if we are willing to sniff out the rats behind the scenes of our battle for freedom, liberty and restoration of America can we heal as a nation. Let us be mindful of the 'who' and let us not allow the individuals responsible for the destruction of our Constitution and Bill of Rights, under the guise of "safety" from "terrorists", to get away with what they've done. The late Aaron Russo warned about how the globalists planned the war on terror to wage permanent war on the world. We know factually from documents, such as the Project for a New American Century (PNAC) and the Neocon now infamous paper 'Rebuilding America's Defenses', that this war on terror was preplanned and part of the globalists take over of the world. Yet to this day no one dares put together charges against the very men who have lied and deceived America on the front end to perpetuate the back-end plans. Without true justice and truth America is dead and will never recover from the wound of 9/11 and all the wars that followed. We must find traction in order to find a solid point by which to stand. We must then (while standing firm) have the courage to move forward within our vision of the future. We must not sympathize with the very people who have orchestrated this misery on humanity. Thus let us use this single point made here to somehow move forward with the next step (in consciousness), whatever that may be. The tools used to push this globalist plan on America and the world were people like Stakelbeck, Phares, and Emerson. The vessels by which they were able to push their lies on Americans were primarily the Christian conservatives who listen to Pat Robertson, CBN, Glenn Beck, Fox News and others. 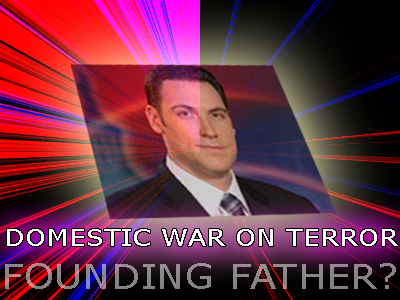 The victims however, in this domestic war on terror are all Americans. Will Christians wake up and realize that figures like Stakelbeck are artificial creations of the CIA and the Pentagon? Will conservatives realize these operations have been going on for hundreds of years especially the last 100 plus years? Will Fox News watchers face the reality of Operation Mockingbird of 1948 where documents prove CIA took over all of the media back then for political purposes? How about the rest of America? Will left wingers realize the domestic war on terror is a fraud and no president is on the side of the people? This is a humanity sized problem that we must confront and solve. The world is drowning in CIA controlled propaganda and it's time to spread the word and bring global awakening to this mind-control madness. Until then, the globalists will continue to create artificial "experts" with no tangible form of legitimacy or credentials, and with unverifiable backgrounds, who then are granted countless public appearances by the very globalist entities that are creating them. They then automatically evolve into meritoriously promoted experts who then play a large hand in the shaping of our world. 1- Operatives will spread their propaganda which by definition is 'information, ideas, or -rumors deliberately spread widely to help or harm a person, group, movement, institution, nation, etc'. 3- When the propaganda fails, they pull off another false flag to maintain their control of humanity through fear. 4- The cycle begins again. F. Turn off your lower brain which is where fear is processed. Realize that humans are meant to be driven by much higher brain functions such as intelligence, creativeness, spirituality, laughter, relationships and camaraderie to name a few. G. Share this information with everyone you know. H. Continue to act out the 'change' that you want to see in the world for every time you do so, you are manifesting the solution in an otherwise dark world. That manifestation itself is the solution. Ask yourself, will you be in 'solution implementation' mode when the next false flag hits? When the next engineered catastrophe strikes, will you be ready? Will you be the active demonstration of the solution and the order that might solve the next problem? Or will you accept their solution to the problem they themselves engineered?